Last night when I was on Pinterest (ooo like that’s a surprise … Penney on Pinterest? ), the words Authentic came across my screen. I clicked on the image to read the whole thing. And then I read it again. Below is the image that I saw last night. It’s one of the popular quotes from Brene’ Brown and a very familiar one to me. Even thought I first read this a few years ago, I still remembered the words. It was like when a song from your teenage years comes on the radio and for some reason, you remember every line. You can’t recall what you had for dinner two nights ago, but the lyrics are right there and roll off the tip of your tongue. If you haven’t read her books or seen her blog site, I urge you to at least take 20 minutes out of your day to view this video called The Power of Vulnerability. She’s pretty amazing and yet so … just like us. You can see yourself in her words. Picture yourself in her stories. She is the true meaning of the word Authenticity. Some days, it’s good to come back to that word. I realize that in most of my posts, I wander around and share stories of my cute dog and weird kid. This image pulled me back to that day when I got the courage to setup a WordPress blog site and start writing. 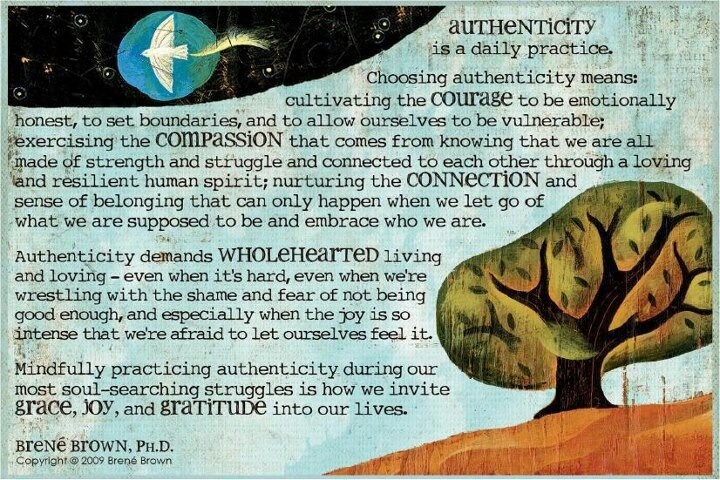 So I wanted to share this with you: these are the words I read when my Journey to Live an Authentic life began …. I just cant help but feel everything about Pinterest screams women. I know it is your thing Penney Pinterest, and I am going to leave it to you. Love that – and I had to laugh when you stated that you “read the whole thing” cause I’m guilty of the whole “if it’s too long I don’t read it”. LOL! I liked that one though! Yeah I read through it few times even though I knew this one of hers. Take a look at some her stuff in the links I posted, I think you’ll like her work.